Candace H. Johnson-For Shaw Media Paisley Janus, 2, of Round Lake Beach and her mother, Magan, play ball in the pool during $2 Tuesdays at the Round Lake Area Park District Aquatics Center on Hart Road in Round Lake. 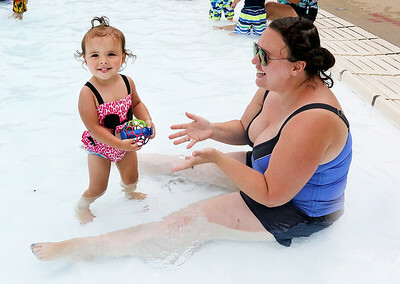 Candace H. Johnson-For Shaw Media Arianne Monti, of Round Lake relaxes with her daughter, Sable Edwards, 3, on the side of the pool during $2 Tuesdays at the Round Lake Area Park District Aquatics Center on Hart Road in Round Lake. 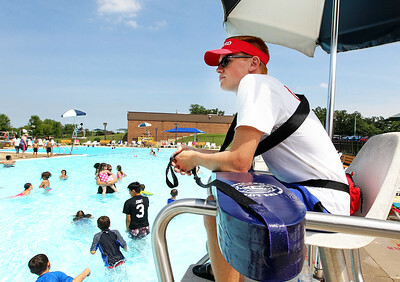 Candace H. Johnson-For Shaw Media Lifeguard Jack Onarheim, 19, of Round Lake Beach watches over swimmers in the pool during $2 Tuesdays at the Round Lake Area Park District Aquatics Center on Hart Road in Round Lake. 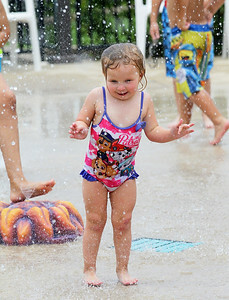 Candace H. Johnson-For Shaw Media Melanie Glassman, 3, of Round Lake has fun in the Splash Pad during $2 Tuesdays at the Round Lake Area Park District Aquatics Center on Hart Road in Round Lake. Candace H. Johnson-For Shaw Media Kaitlyn Bartlett, 9, of Ingleside has fun jumping off the diving board during $2 Tuesdays at the Round Lake Area Park District Aquatics Center on Hart Road in Round Lake. 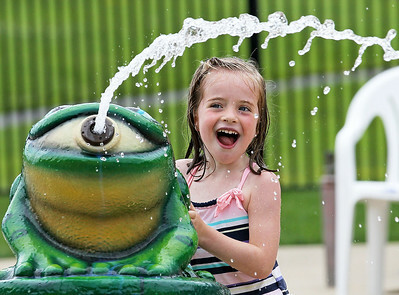 Candace H. Johnson-For Shaw Media Geneva Erl, 4, of Round Lake has fun shooting water in the Splash Pad during $2 Tuesdays at the Round Lake Area Park District Aquatics Center on Hart Road in Round Lake. Candace H. Johnson-For Shaw Media Aaron Veloz, 1, of Fox Lake sits under a giant bird in the Splash Pad during $2 Tuesdays at the Round Lake Area Park District Aquatics Center on Hart Road in Round Lake. Candace H. Johnson-For Shaw Media Nicole Ricci, of Lakemoor watches over her niece, Korra Patel, ten-months-old, in the pool during $2 Tuesdays at the Round Lake Area Park District Aquatics Center on Hart Road in Round Lake. Candace H. Johnson-For Shaw Media Joe Patterson, of Ingleside has fun lifting up his daughter, Dylylah, 8, in the pool during $2 Tuesdays at the Round Lake Area Park District Aquatics Center on Hart Road in Round Lake. Candace H. Johnson-For Shaw Media Adults and kids swim during $2 Tuesdays at the Round Lake Area Park District Aquatics Center on Hart Road in Round Lake.The pool is a 0 depth pool to 12 feet. 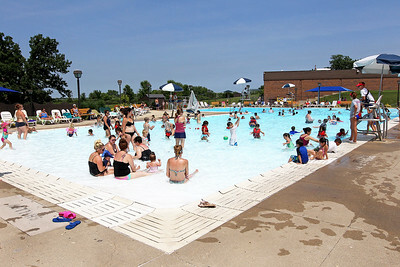 Adults and kids swim during $2 Tuesdays at the Round Lake Area Park District Aquatics Center on Hart Road in Round Lake.The pool is a 0 depth pool to 12 feet.